Our front office is open every day from 8 am to 6 pm. 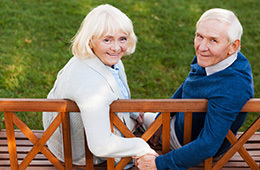 Assisted living is housing for those 62+ who require assistance with activities of daily living. We offer housekeeping, laundry, and various other services to help each resident attain their highest level of independence. What languages do you speak at Park Place? At Park Place we speak both English and Tagalog, but we will work with other languages as well. Please contact our assisted living director for more information. While our community does not allow pets to live in the apartments, pets are always welcome to visit. We ask that each pet have their current shots and be kept on a leash when in public areas. At Park Place we have a both a beauty salon and barbershop on-site that offer a variety of services including: haircuts, manicures, pedicures, and more. Please inquire at the front desk for more information. We offer free Wi-Fi Internet in select areas for residents and their guests. Please inquire at the front office for individual apartment activation information. We offer access to cable television for all residents in their rooms. Apartments do not come with televisions. There is a micro kitchen in each apartment. This includes a microwave, small refrigerator and bar sink. We have open dining in both our restaurant and our deli. We provide three nutritious and delicious meals to each of our residents daily. Both the deli and restaurant have open, extended hours to meet the needs of our residents. We believe events and activities enrich our resident’s lives and have a powerful impact on their personal well-being. We create a fun, uplifting environment where our residents can be social, get involved, and enjoy their favorite hobbies and activities. For the safety and health of our residents and staff, Park Place is a smoke-free community. We do, however, have designated smoking areas outdoors. Please ask the front desk for the location of our designated, outdoor smoking areas. At Park Place we have a full-time business office manager. Our business office manager will answer any questions you may have regarding financial or billing concerns. To make an appointment with our business office manager, please contact the front desk.